I started out with After Effects as my first compositing software and being layer-based, the learning curve was not that steep since I use Photoshop religiously since 2001. To be frank, my first exposure to node-based compositing is not through Nuke but with Shake. 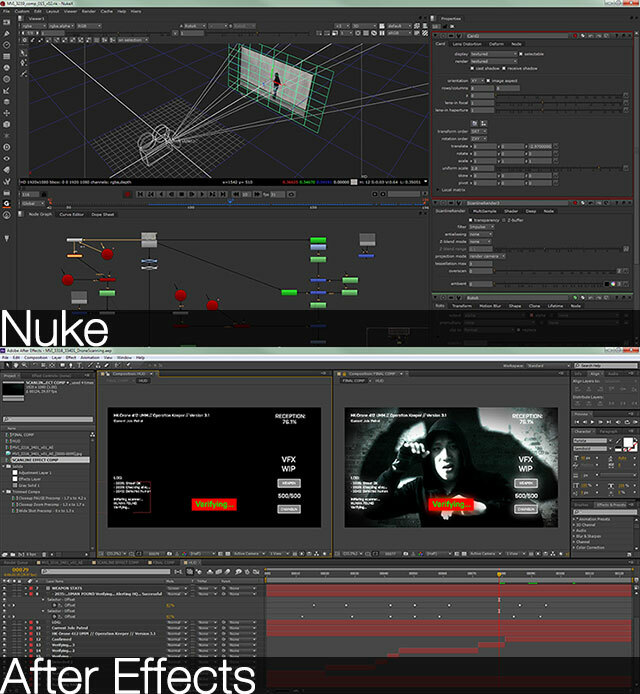 Not that shake that you drink or shaking someone hands (same goes with Nuke as it does not imply launching a nuclear bomb to solve your compositing problem neither does After Effects with its unknown side effects in the visual effects industry). To make things easier to read instead of a wall of text, I will list it down in summarized form. Node-based allows for easy iteration when working on a look. Just copy paste and tweak away while easily view the previous settings in a easy to read node graph. Easy annotation feature such as Backdrop and StickyNote especially when the script get really huge to navigate. Connect up to 10 different nodes to the viewer using the number key. This means easy switch to another node from the same viewer. Good luck trying that in After Effects! True 3D environment meaning you can work with 3D object/animation seamlessly with the final 2D composite although After Effects CC do support it with the Live 3D Pipeline which uses Cinema 4D Lite. Dope Sheet and Curve Editor that can be easily filter to the active nodes of your choice. Less clutter to see compared to AE. Non-intuitive aka terrible when working with motion graphics. Switch to After Effects if you need to do motion graphics. Lots of powerful tools out of the box for pulling out matte such as Primatte, Keylight, Ultimatte, IBK and the ever useful Keyer even though it is pretty basic. Rotoscoping! Much much intuitive to use versus the rotoscoping method in After Effects. Don’t get me started on RotoBrush in AE. Trying to change keyboard shortcuts? Well it is not as direct as changing key bindings in most popular video games. Not a true 3D environment workflow for most functions (turning a layer into 3D makes it into a card) although AE CC fixes this with Live 3D that allows the user to edit the geometry in Cinema 4D Lite and updated automatically in AE. Wiggle wiggle wiggle. (Ok Wiggle is an expression use for scripting that well ‘wiggle’ between defined values). Need to work with audio? After Effects is your best friend once again. Trying to change keyboard shortcuts? Well no such option in AE too but fret not! Read up this link on how to modify keyboard shortcuts in AE. Your project can be a wilderness when you have hundreds of layer/comp. The clone stamp tool is pretty versatile and familiar if you use Photoshop a lot. IMHO, the timeline view and editing is much much easier to work with than Nuke (although to be fair, Nuke workflow often involve per shot basis instead of multishots). The listing is not meant to be neither pros or cons but my general observation after using both software for many years. To wrap up, things will change in the future when newer updates improve on existing feature which will lead to a new workflow. Still it depends on how much you willing to learn and put in effort to get a job done. What’s important is the end user attitude and not the tools.